What Does H. Pylori Do To Your Stomach? Gastritis is a very common disease that has been related to stress, but it can also be caused by bacteria. Helicobacter pylori is known to infect the stomach and provoke disruptions that lead to gastritis and ulcer formation. Keep on reading to know more! Luck plays a major role when it comes to scientific discoveries more commonly than you would imagine. This is the case of the discovery of Helicobacter pylori, a bacterium that was detected in gastric tissue obtained from patients who suffered from gastritis and ulcers. Before this, the general knowledge of bacteria present in the digestive system didn't really suggest that these microorganisms could be linked to diseases. After the identification of H. pylori, new questions were asked regarding the role of bacteria living in our gut and their possible involvement in the development of disease. H. pylori was discovered in 1982 thanks to a small not intended change in the experiments conducted by Robin Warren and Barry Marshall, from the University of Perth, in Australia. This discovery granted them with the 2005 Nobel Prize in Physiology or Medicine because they didn’t only isolated the bacterium, but also untangled its role in gastritis and peptic ulcer disease. Since its discovery, this bacterium has also gained notoriety because it might be also one of the most important risk factors in the development of gastric adenocarcinoma, better known as gastric cancer. If you’re lucky enough not to actually suffer from gastritis, I’m pretty sure you have heard about it from a relative or friend. Gastritis is a condition from the digestive system that mainly affects the gastrointestinal track. In simpler words, gastritis is an irritation of the wall of the stomach, which causes pain, bloating, nausea and vomiting, indigestion and loss of appetite. It can even get worst, cause bleedings and be accompanied by the formation of peptic ulcers, which are crater shaped lesions on the lining of the stomach that appear as consequence of an increased secretion of acid gastric fluids into the stomach. By the time Warren and Marshall were working on their experiments, the common belief was that gastritis and the formation of gastric ulcers was a product of stress and a hustled lifestyle, alcohol consumption or a diet rich in acidic foods and beverages, among other factors. Doctors never actually thought that these conditions had anything to do with bacteria. 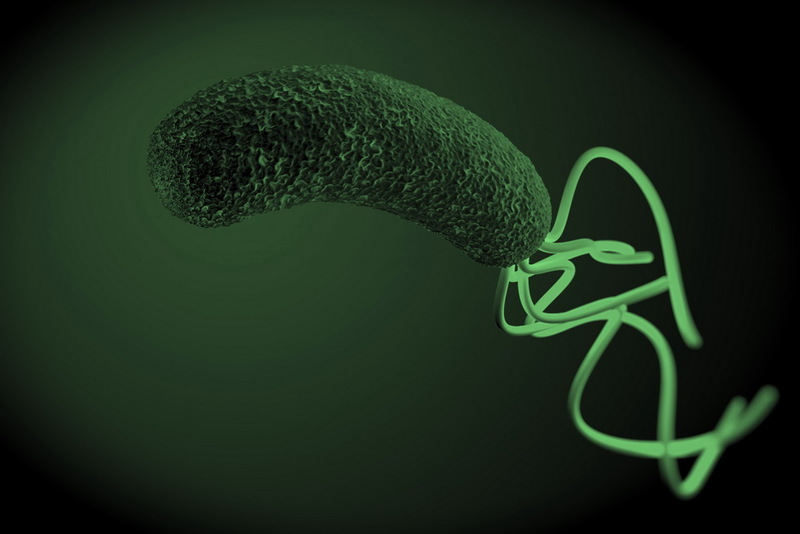 The discovery of H. pylori was an accident, a lucky accident. After Warren and Marshall could identify the bacteria, their experiments showed that most of the patients that suffered from gastritis also had the bacteria in their stomachs, and all of the patients with gastric ulcer were infected by H. pylori too. After a series of studies, and one even performed by Marshall on himself, it was finally possible for them to confirm the infection by H. pylori as trigger in the formation of peptic ulcers and some cases of gastritis. MARSHALL, B. J. 2001. One Hundred Years of Discovery and Rediscovery of Helicobacter pylori and Its Association with Peptic Ulcer Disease. In: MOBLEY, H. L. T., MENDZ, G. L. & HAZELL, S. L. (eds.) Helicobacter pylori: Physiology and Genetics. Washington (DC). What H Plyori can cause to my stomach?